have you noticed a trend in my blog entry openings? they all begin with an apology. this one is no exception. i'm sorry - i realize that i'm the worst at updating! things are going well here in south korea. it's colder than snot as we were blessed with an autumn season that lasted approximately 4 whole days. i'm not kidding. unfortunately, we went straight from a blazing hot summer right into winter. the heated floors (still one of my top 5 favorite things about korea) have been turned on in my apt for about a week or 2 now. if you know me at all, you know that means i've gone into hibernation. i despise the cold as it is, but thanks to my (american) parents' lovely black lab, i'm coming up on my 2nd anniversary with the wonderful metal plate in my ankle. (another GREAT story if you haven't heard it already) the cold weather really irritates the plate and makes it hurt a lot so i basically wear those horrendous uggs everyday to keep the ankle warm...and stay inside as much as possible! i've been busy on the weekends traveling north to see my family. i have only 12 short weeks remaining in korea, so we're making the most of the time while we have it. a few weeks ago, we drove (forever) to a beach on the eastern coast of korea. a popular vacation spot during the summer, it was rainy & cold on the day that we visited. :( but here are a few shots: (above) crammed in the backseat with my cousins so-mang & sun-mi. we started the drive at 6am...bugh! (above) with omma & appa behind the creepy sand mermaid. some random korean guy made this on the beach! (above) with my cousins on a boat. last weekend, my family invited some of my american friends up to seoul so that they could meet them. it was a lot of fun for everybody despite the language barrier & we ate until we thought we were going to explode. the night was a big success and my family already wants to know when my friends can come back up to visit. (above) at my parents' house with joshua, john, & cousin sun-mi. (above) after dinner, omma laid out this spread. we were already SO full but she prepared all of this food and yelled at us to "eat a lot!" we thought we were going to die. (above) my cousins are so cute. sun-mi & so-mang were sort of our unofficial translators for the evening. their english is better than they would admit. (above) joshua & john, 2 other english teachers in my program. i consider them to be 2 more brothers...they are absolutely wonderful to me! next weekend, i will be having lasik eye surgery. my horrendous eye sight comes from my father, and he and my younger brother have both had the surgery with great results. i went and had the consultation last week and was run through a whole gamut of tests. they say i'm a great candidate for surgery and should see 20/20 after all is said and done. great news for someone who will literally run into walls without her glasses or contacts! the consultation was interesting since the staff had to speak in english to me and answer omma's questions in korean. i felt bad for working them so hard -- we should probably give them a really nice tip! i'll let you know how surgery goes in the next update...pray for a quick & painless recovery! before i came to korea, many people told me that i should write a book. my life has always been really ridiculous & hilarious -- i seem to find the strangest situations possible and meet the weirdest people. my "korea" chapter has been no exception. i think any foreigner living in korea could write a really interesting & helpful book for others interested in travel. but given my being a korean-less korean in korea, my situation proves to be much more challenging/hilarious/confusing than others. 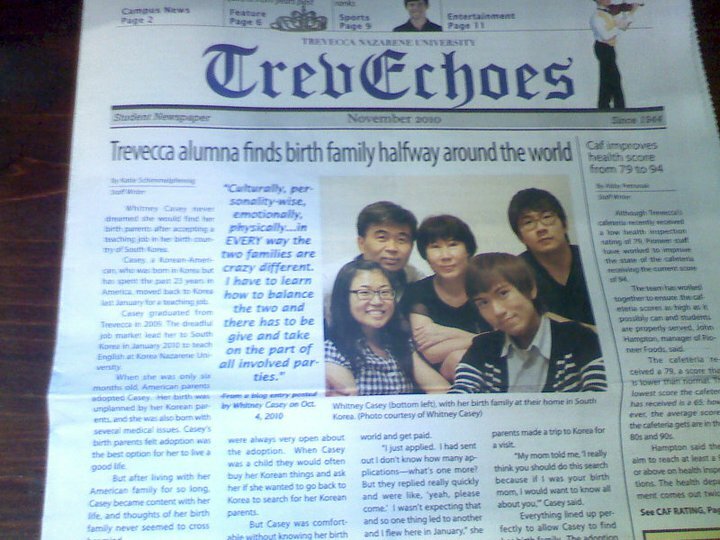 then you throw in the birth family reunion thing, and it gets REALLY interesting! what do ya'll think about a book-writing endeavor? 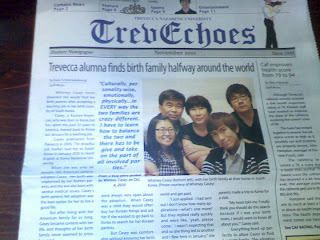 quick shout-out to the great folks @ trevechoes down in nashville, tn. they wrote a great article about my experience meeting my birth family and were thorough (and patient!) enough to interview both me & my little brother in china for the story. good work...thanks again, katie & morgan! be back soon with more stories & pictures. i'll be seeing you stateside folks sooner rather than later!